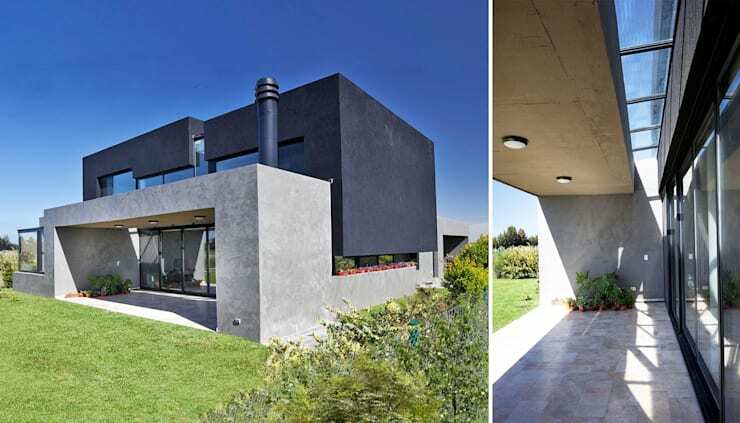 Speziale Linares Architects based in Buenos Aires, Argentina are known for their innovative and modern building designs. Today we get to take a closer look at a residential structure they came up with and which had been completed in the year 2011. 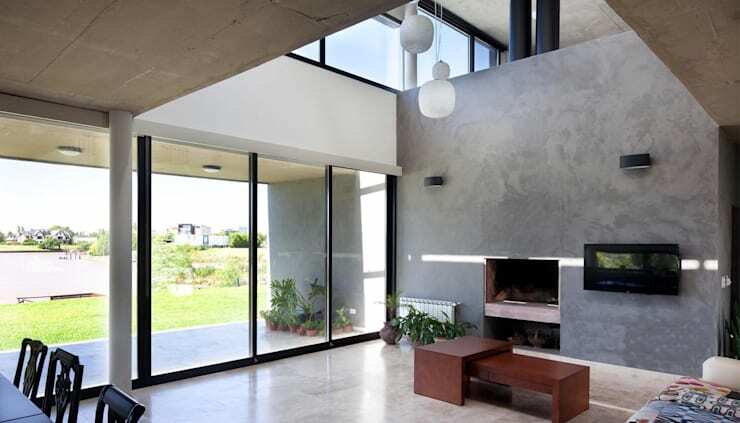 The Casa JG is a 220sqm private residence used as a weekend house, and is located in the San Benito neighbourhood in the Entre Ríos Province of Argentina. It is a very well-located home, since it has access to a river, which offers much potential. 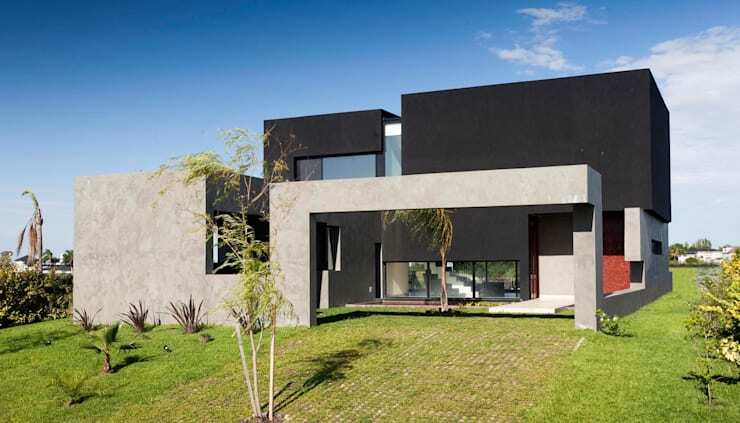 The architects developed the idea of a rather compact house with several volumes stacked upon each other, in order to situate the home in the middle of the lot, allow front yard access and parking space, as well as preserving the large back yard area. It is a home perfectly assembled like building blocks, and now we have the chance to take a look around! Here we have a front view of the home from the front yard driveway which leads up to the parking space. As we can see, the lot offers much green space, vegetation and opportunity for garden plants, as was the architects' intention. From this perspective the house seems to be constructed of differently coloured building blocks, each with their own unique form and fitted into one another like Lego blocks. The dark, black-painted volume seems to be suspended on the grey foundation, and this houses the private sector of the house. Moving through underneath a grey arch, which seems to be a cut-out of the grey 'building blocks', we find a courtyard enclosed in the perimeter of the building, which serves as parking space. Here we get a good view of the home's entryway. Inside the perimeters of the building, we find ourselves standing in the courtyard, which is also used as parking space. From this courtyard a flat, white bridge extends from the lawn to an equally flat and white door. 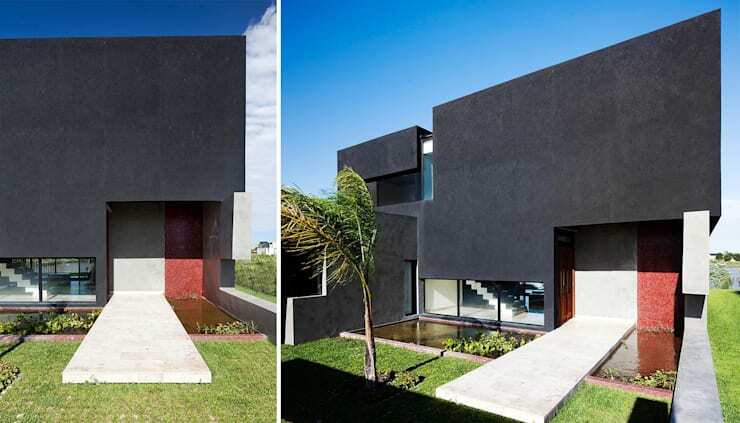 This use of material and colour ensures a continuity which contributes to the building block effect of the entire structure. The white bridge and door are set against a red wall backdrop, and all of this is nestled in the black volume of the house, which creates a tricolour-blocking effect. The bridge extends over a pond in front of the home, and this has both an aesthetic and practical value. Not only is the pond and the plants in it a beautiful element, but it divides the home (living space) from the courtyard, parking space, and eventually the street. Let's take a look at the house from the back. Here we can see a much clearer division of the black and grey volumes. This also means that we can clearly see the difference between the private (black) and social (grey) areas of the house. 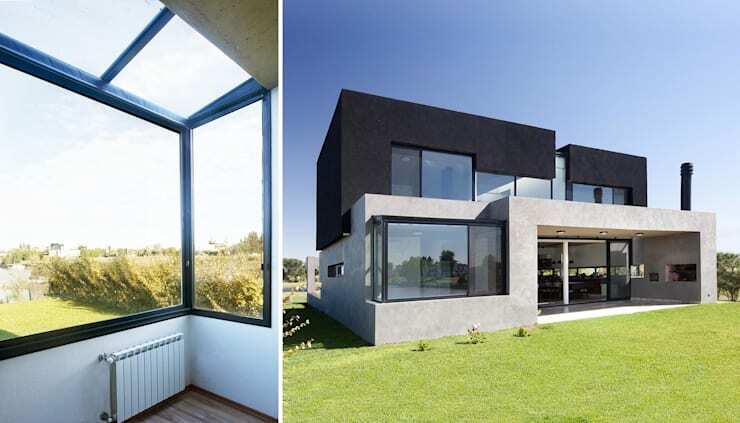 The abundant windows used in the structure is a defining element. This side of the house especially has many large windows opening up to the back yard. Looking from the inside, we can see that these glass fixtures allow much natural light to enter the rooms, and also provide access to a lovely view. We can also see the porch of the home here, neatly carved into a grey building block. It opens up from the living area of the home, and has a convenient BBQ carved into the right wall. Perfect for entertaining. Don't forget: It’s Braai Season So Design Your Perfect BBQ Area! 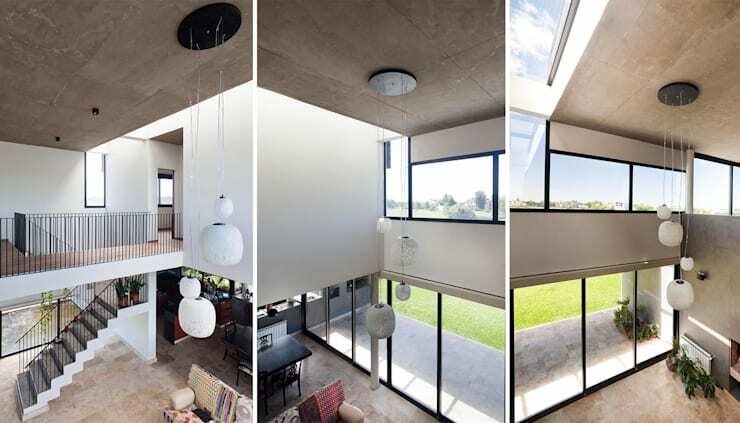 Now, as we'll see in these images, the interior of the home is very large and generous in open space. One wouldn't have thought this looking at the compact structure of the home on the outside. This is achieved by open-plan design, both horizontally and vertically. We can once again see how the substantial windows allow ample natural light to enter the interior, reaching all its corners. A skylight is even visible. The main artificial lighting source in this area is a centre piece of several pendant lamps hanging low from the ceiling. In addition to this, there are only a few other ceiling and wall lights visible. The space is kept simple and subtle in the use of materials, colours, and the lack of ornamentation. Let's take a closer look downstairs. Here we can see an entertainment area with little furnishing and decoration. In the near left corner we can see an indication of a dining room table, but the majority of this space is a blank slate to accommodate whatever the inhabitants had in mind at a certain time. It is certainly a great entertainment venue to be adjusted to the occasion. At the back we can see and indoor fireplace, perfect for winter parties. The area opens up entirely by means of sliding glass doors to the left, which means that the party can easily shift between the inside and outside of the house as the night progresses. Lastly, we take another look outside to take a better look at the porch area. In the left image we can better see the cut-out porch area in the grey building block. As we could recognise from the interior, this porch is separated from the indoor area only by large, sliding glass doors, which means that the space can be easily extended into a much larger area as necessary. In the right image we can see the space viewed from the porch itself. In the roof of the porch, just where it extends from the house's façade, is a strip of skylights, which not only allows for natural light on the porch, but also ensures that the extended, covered porch does not block of natural light to the interior of the home. What do you think of this home's modernist design? Let us know your thoughts!